(From L to R): Lindsay Peach, Vice-President, Integrated Health Services Community Support and Management, NSHA; Dr. Martin Alda; Dr. Steve Armstrong, President & CEO, Genome Atlantic; Dr. Rob Annan, Vice-President, Public Affairs & Communications, Genome Canada; Dr. Rudolf Uher; Janet Knox, CEO, NSHA; Brian Thompson, CEO, DMRF; Dr. Gail Tomblin Murphy, Vice-President of Research and Innovation, NSHA; and Dr. Colin Dodds, Trustee, Research Nova Scotia Trust. (David Grandy photos). A new research project led by researchers in Dalhousie University’s Department of Psychiatry will explore the genetic factors that play a role in bipolar disorder (BD). Dr. Martin Alda and Dr. Rudolf Uher say their work could lead to new clinical tools to better diagnose and treat the disease. BD is a serious, chronic psychiatric illness that affects young people in their early 20s and recurs throughout their lifetime. It affects an estimated 500,000 Canadians and is one of the top 10 causes of disability and mortality worldwide. Genetic factors influence who is at risk from BD and how individuals respond to long-term treatment. The three-year, $975,000 research project was unveiled during a joint announcement and panel discussion event hosted by Genome Atlantic at Dalhousie’s Life Sciences Research Institute (LSRI). 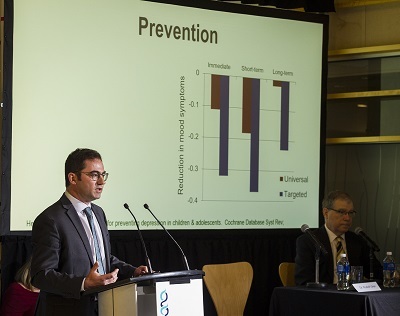 The study will use genomics to develop new screening tools for early detection and identify the best long-term treatment for individual patients, rather than relying on a “one size fits all” approach. Ultimately, Drs. Alda and Uher hope to engage clinicians and patients in the individualized management of BD, based on new treatment guidelines informed by this work. Genomics should also allow clinicians to more quickly pinpoint people at risk of developing BD. Dr. Uher also stressed the importance of an early diagnosis, given that the risk of suicide in individuals with BD is highest in the first years of the illness – a time when treatment delays can occur. Following a reception in the McNamara Boardroom of the LSRI, the event got underway with short speeches from Dr. Steve Armstrong, President & CEO, Genome Atlantic; Janet Knox, President & CEO, NSHA; and Dr. Colin Dodds, Trustee, Research Nova Scotia Trust. Dr. Armstrong spoke to the timing of the funding announcement, which took place a week after Bell Let’s Talk Day and its focus on “awareness, compassion and understanding” of issues related to mental illness. 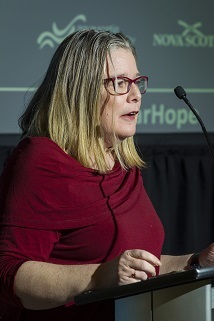 Moderator Cynthia Maillet, a former broadcaster with CBC and Radio-Canada, then took the stage along with Drs. Alda and Uher and Johanna Begin, a patient of both Dr. Alda’s Mood Disorders Clinic and Dr. Uher’s Families Overcoming Risks and Building Opportunities for Well-being (FORBOW) program, to commence the panel discussion portion of the evening. “It has been a long and sometimes arduous journey to get to where I am standing today,” said Begin. “My children and I have been able to incorporate into our lives the tools given to us by the Mood Disorders Clinic and FORBOW. This is a lifelong learning process, and it is because of these tools that we can create areas of a healthy and balanced life. Genome Atlantic is a not-for-profit corporation whose mission is to help Atlantic Canada reap the economic and social benefits of genomics. Dr. Armstrong described the project as “a collective investment” that will allow its partners to “maintain a leadership position” in the competitive genetics and genomics space. Early detection of bipolar disorder and optimized selection of long-term treatment is supported by Genome Atlantic with funding provided from the Dalhousie Medical Research Foundation, the Dalhousie University Department of Psychiatry, Genome Canada’s Regional Priorities Partnership Program, the Research Nova Scotia Trust, the Nova Scotia Health Authority and Dr. Uher’s Royal-Mach-Gaensslen Prize for Mental Health Research. For more information about the research project, please read Genome Atlantic's news release.